Note: The “Designer” is mentioned throughout this article because they will normally perform the majority of these tasks. Feel free to substitute that term with the employee who will perform each duty in your shop. As the name suggests, this section describes many of the actions employees have with artwork other than routing them to new statuses. Each line item may be associated with its own Artwork Group, but multiple line items can also be associated with the same Artwork Group. One of the first tasks the Designer performs is to create the Artwork Group and determine how Artwork Groups should be tied to line items. To create a new Artwork Group on the order's Artwork tab, the Designer will click the Add Artwork Group button. The new Artwork Group will automatically be given the next group letter and the Document Management folders created. All of the line items (including child items) are listed with checkboxes next to them. Checking a line item associates it with that Artwork Group. If it was already associated with another Artwork Group, it is automatically removed from that group. If no line items are associated with the Artwork Group, the Artwork Group remains but is set inactive and displays a message to the user. Adding Proof Files to an Artwork Group is done automatically when a new proof file is placed in the Artwork Group's Proof folder. The Artwork Group folders are automatically created when the group is created. Once the artwork record is created, the designer can adjust the description, add comments, and adjust any other properties available on the artwork proof record. Adding additional proof files to a group is done simply by adding a new artwork file (one with a unique name) to the Proof folder. Adding more than one proof file will automatically change the Artwork Group type to “Collection”. Since this functionality is automatic based on changes in the files, Control does not enforce any internal security and anyone with write access to the Artwork Folder can add a new artwork proof file. A Designer may need to remove a particular proof file from exposure to the customer. Setting the artwork item inactive on the order’s Artwork tab accomplishes this. An artwork item can be made inactive on the order’s Artwork Tab by selecting the proof’s action “Set Inactive”. Inactive Proof Files are not displayed to the customer. No comments can be added to Inactive Proof Files. Inactive Artwork Items (Proof Files) can be set active on the order’s Artwork tab. Note: An Artwork Group cannot be manually set inactive, but becomes inactive automatically when no line item uses that group. When a line item is set to use an inactive Artwork Group, it automatically becomes active again. The Approver can be set on the order’s Artwork tab. If defaults are entered in the customer’s record, these values are used. Customer-specific defaults are entered on the Artwork tab in the company record for that customer. Defaults for all Named Roles may be set. When customer-specific defaults are not found, store defaults for the Employee Roles are used. Any employee with rights to edit an order artwork can alter any of the named roles. All employee roles must be existing (active) employees in the system. The approver must be an existing (active) customer contact. Comments are visible to Customers and to other employees. Employees view and add comments on the artwork tab on the image proof detail. Customers view and add comments on the Artwork Approval CloudApp. Comments do not trigger a change in status. All comments trigger notification emails to Named Employee Roles. The due date and time for an artwork group defaults to the order's Proof Date. It can be initially set by an employee with the ability to create an artwork group. Changes to the artwork due date/time are logged and generate notification emails to Named Employees. The option to Send Reminder Emails is available to all users when the artwork status is “Pending Approval”. 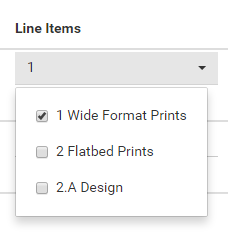 This action sends reminder emails to the Named Customers for an order and is available on the order’s Artwork Tab for each artwork group. Changes the status of the Artwork Group to “Pending Approval”. Initiates notification emails to all Named Customer and Employee Roles. Note: Each artwork group must be released for approval individually. By design, the customer approval will normally advance the artwork to Production. However, at certain times it may be appropriate to bypass the customer approval because the artwork was previously approved or the customer verbally approved the artwork. In this case, the artwork may be marked Approved manually. Manually changing artwork status triggers notification emails to all Named Roles. *Changes the status of the Artwork Group to “In Design”. *Initiates notification emails to all Named Employee Roles. If a change in the artwork is required, it may be necessary to send it back for Customer Approval. The “Return Artwork for Customer Approval” action performs this task. This action can only be invoked by an employee with the rights to release artwork for customer approval. There may be times when it is desirable to return an artwork group with the status of Produced back into production. The action “Return Artwork to Production” changes the status from Produced to Production Ready. This action may be invoked by an employee with the rights to mark the artwork group Produced in the first place.